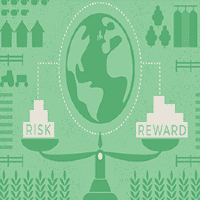 ■ Our Global Farmland index recorded an average annualised growth of 13.3% since 2002 and 2% over the past five years. ■ Although pressure on commodity prices has slowed growth in values in recent years, the long term fundamentals of farmland ownership still apply with increased food production and competitive land use driving demand. ■ Our Opportunity v Risk Matrix tool considers these relative opportunities and risks of farmland investment in different countries. ■ The key to a successful global farmland investment portfolio is to understand the range of cultures, political administrations, ownership structures, tax regimes and foreign investment regulations. 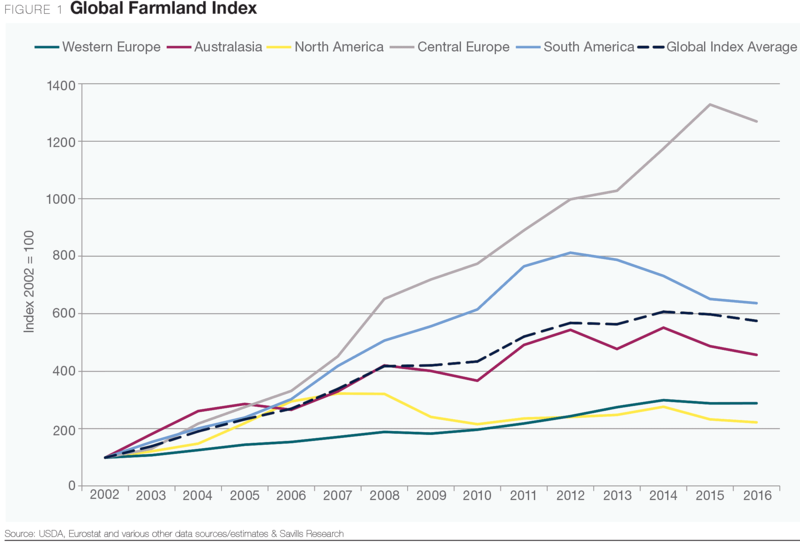 The value of farmland across the world is tracked by our ‘Global Farmland Index’ launched in 2012 (see boxout below). The index now reports to 2016 and highlights the strong and steady rise in the value of farmland globally over the past 14 years. During this time, our index recorded an average annualised value growth of 13.3%. The largest increase in farmland values occurred in the six years between 2002 and 2008 with the Global Index recording an average annualised rise of 27%. This exceptional pace of growth did not continue with such impetus (6.4%) during the six years that followed due to a softening in farmland prices between 2008 and 2009 as some of the more mature markets experienced a correction in values, notably Ireland and Denmark where the global banking crisis caused prices to fall. More recently, pressure on commodity prices has slowed average growth in values (2% in five years to 2016). In spite of this, the long term positive fundamentals of farmland ownership still apply with increased food production (balanced by reduction in food waste) and competitive land use, driving demand. Figure 1 illustrates a divergence in the rate of growth in the world markets between 2008 and 2015 and demonstrates how the rate of growth varies significantly across the world. 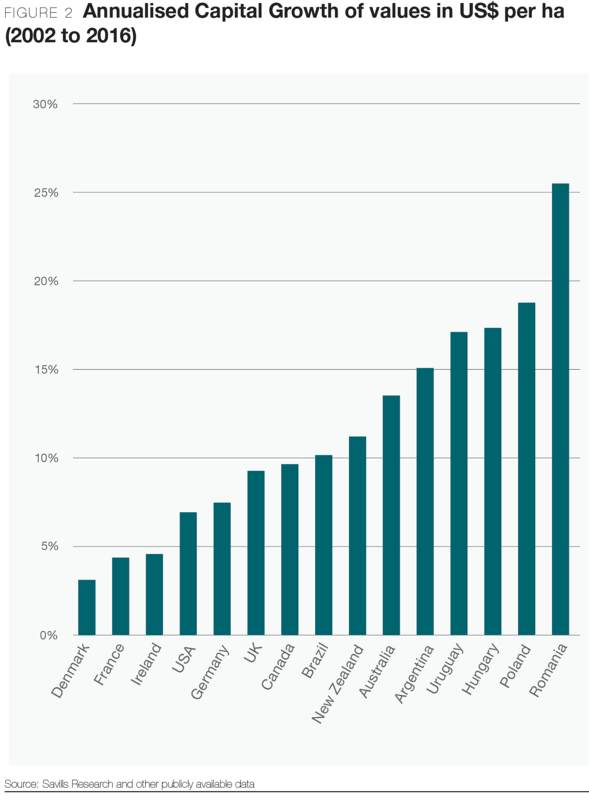 Indeed, values across Western Europe recorded the most varied patterns, from significant value growth followed by a correction in Denmark and Ireland to steady but strong growth in the UK and Germany and a relatively flat performance in France. Reflecting the lower risk profile of a mature market, annualised average growth across Western Europe stands at 6% since 2002, which is significantly lower than that recorded in the emerging markets (20%) but comparable to North America (8%). The highest rates of farmland growth continue to be recorded in the emerging markets of Romania, Hungary, Poland, Uruguay and Argentina. Germany has recorded strong growth in values since a policy shift in 2010 by the German Agricultural Land Body (BVVG) to sell off previously state owned land in East Germany to private investors. This land had, since 1992, previously been leased.